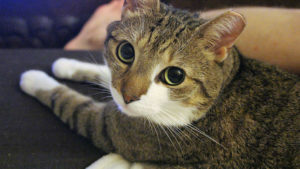 Why Do Cats Knead Things with Their Paws or "Make Muffins"? 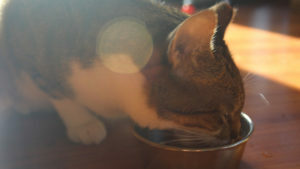 Cats have a number of odd behaviours we as owners don’t always understand. One of the oddest is when they knead us or other objects in the household. Why do cats do this? Why are they so obsessed with pushing their paws into us? Is it a form of calming themselves down? Is it a form of showing comfort or affection? Where does this habit come from and does it have any evolutionary purpose? Kneading is when pushes in and out with alternating paws. 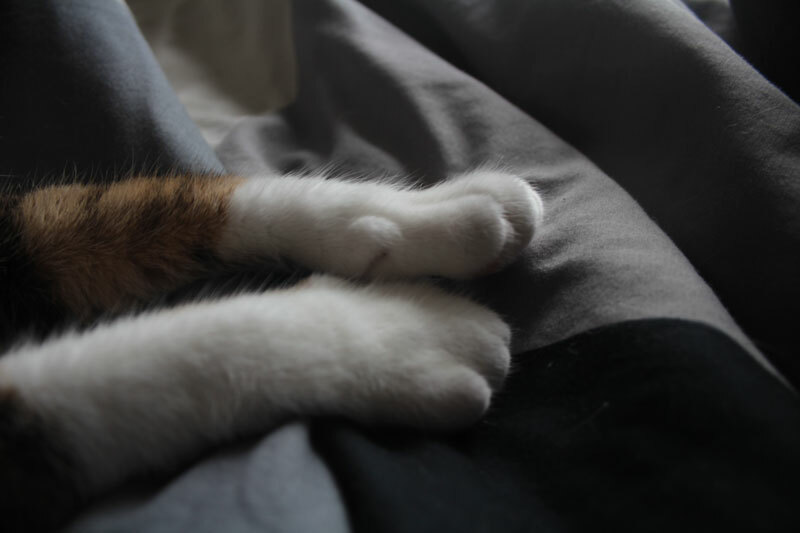 Commonly cats will choose to perform this action on soft materials such as blankets, pillows or even their squishy owners! WHAT ARE SOME OTHER NAMES FOR KNEADING? Over the years kneading has been given a number of nicknames including “making muffins,” “making bread,” “kneading dough.” and “making cookies” As you can tell they all have to do with some sort of food making and commonly with sweets that need some sort of dough. SO WHY EXACTLY DO CATS KNEAD? As is with many cat behaviours, we’re not 100% sure why cats knead, however, we do have a number of theories/hypotheses that seem to make sense. IT’S EVOLUTION BABY AND I’M JUST TRYING TO GET COMFY! Some researchers believe that kneading has absolutely nothing to do with feeding, but is due to an instinct from your cat’s ancestors. It is hypothesized that cats in the wild have always kneaded the ground they are going to sleep or give birth on, similar to dogs who spin circles in their beds. Wildcats are known to knead both dirt as well as tall grass to make a comfy cushion to sleep on. A few days ago I discussed the importance of scenting in cats and some vets and researchers believe that kneading is just another form of scenting. 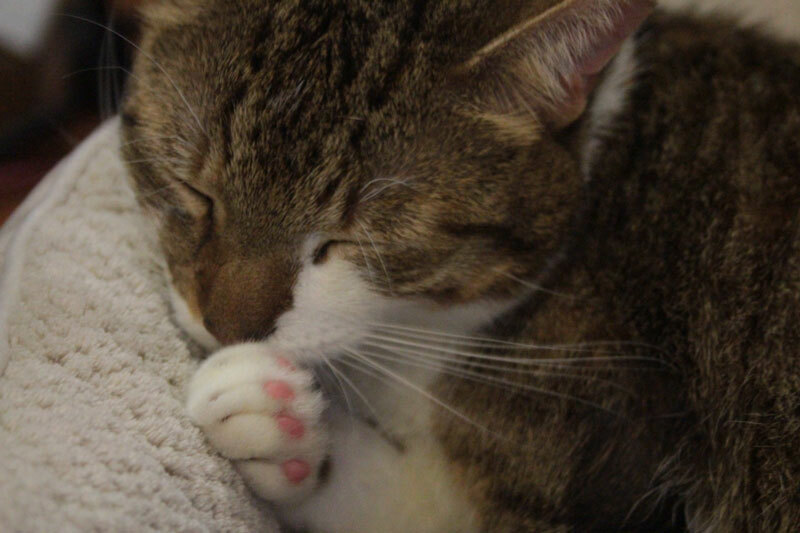 Since cats have scent glands on their paws, this action might just be another way for them to express comfort or even territory before sleeping. Similar to scenting, your cat may just be expressing how comfortable they are with you. Tying all of the hypotheses together, this is the theory that cats will scent you or objects around them because they give your cat comfort. The happier your cat is, the more they will knead and the more scent they will leave on you. With this belief, it’s not the fact that the kneading calms the cat down, but that your cat is so calm that they knead out of habit. A Helpful Tip: If you find it uncomfortable when your cat kneads you, place a soft blanket between you and your cat. 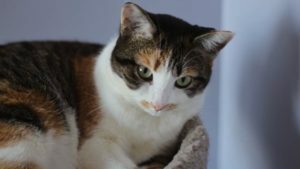 Since it can be safely assumed that your cat is kneading you out of love, you will want to make sure to allow your cat to express this behaviour fairly freely to keep them calm and happy. I’M SORE AND I NEED TO STRETCH!! 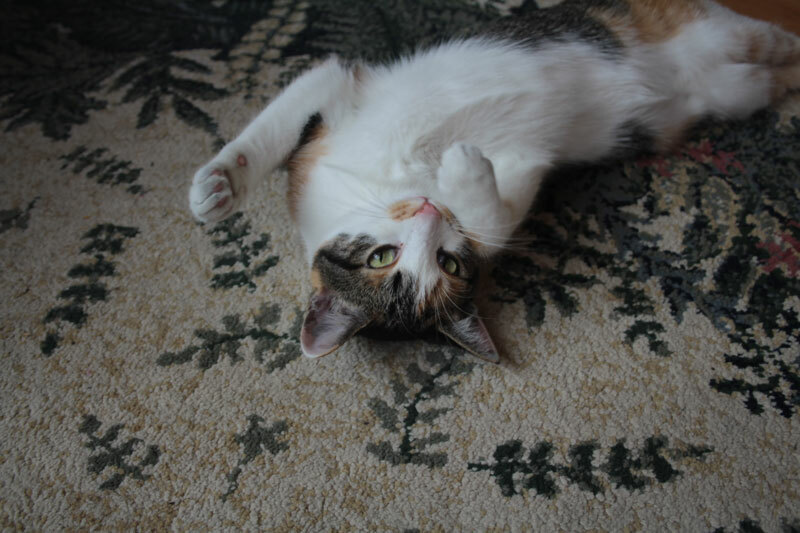 Cats have many ways that they keep in shape and stretching is one of their top choices in exercise. 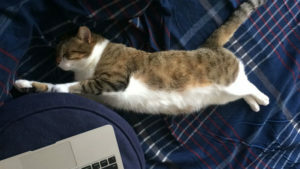 Whether it be a “good morning” stretch or an “I just ate too much stretch”, cats like to keep in shape. Kneading is thought to be another great way for cats to keep in shape. I WANNA MAKE A BABY!! Female cats who are in heat are known to knead to let tomcats know that they are fertile and ready to mate. While it’s unclear why exactly cats knead, we have a fairly clear understanding that it must have to do with them calming themselves down as well as scenting the things they love around them. So I’m interested in knowing, do your cats knead? How often? What’s their favourite object or person to knead? Let me know in the comments below!